Boston Bruins fans have been waiting since 1972, but can once again call their team Stanley Cup Champions. The Bruins broke their 39 year drought beating the Vancouver Canucks 4-0 in game 7 of the Stanley Cup Finals, earning the right to etch their name on the Stanley Cup along with hockey legends, past and present. The Bruins were anchored by another strong defensive performance by goaltender Tim Thomas and defensive core, Zdeno Chara and Dennis Seidenberg. Thomas posted his fifth shutout of the playoffs, two of which came during the finals turning away all 37 shots he faced. 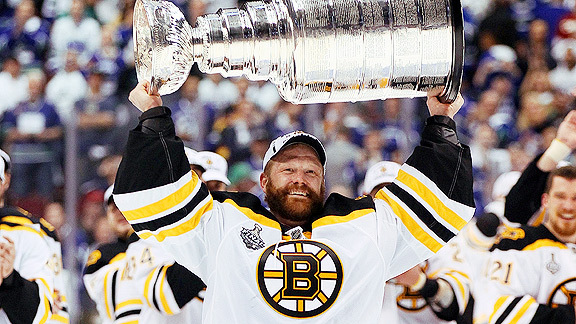 Tim Thomas' performance through the finals earned him the coveted Conn Smythe Trophy, given to the most valuable player through the playoffs. Thomas and the Bruins defense shutdown the Canucks' offensive talent once again. Star twin brothers Henrik and Daniel Sedin were virtually non existent in both game 7 and the series. The duo combined for only 5 points in the finals, 4 of which belonged to Daniel. Boston Bruins' rookie Brad Marchand proved to spark his team from the very first puck drop being a part of 3 of the 4 Bruins goals. He was the primary assist on the games first goal, beating the Canucks to the puck after an offensive zone face-off and fed the puck to Patrice Bergeron in the slot, beating Luongo off the far post. Both Marchand and Bergeron would find the back of the net in the second period. Marchand netted his first of the game and 10th of the playoffs after a quick rap around bouncing the puck off a flailing Luongo, while Bergeron took more of an unorthodox route to scoring his second of the night. On the penalty kill, Bergeron took the puck off of a wild bounce around the Canucks defense man while on the break a way Bergeeron was taken down from behind and the pile crashed into Luongo, shaking the puck loose and into the net. The play was reviewed however the call on the ice proved to be the right one and the Bruins jumped ahead by three. Marchand would put the dagger through the hearts of the Canucks when scoring an empty net goal with under 3 minutes to go in the game. Just minutes after that empty net goal the Bruins showered the ice with their gear, crowding around Thomas in his crease, now Stanley Cup Champions.